The Dimplex 28in Premium Electric Fireplace Log Set is an insert designed to offer realistic flames and supplemental heat for living rooms, bedrooms, and more. The attractive design of the fireplace insert includes a real grate as well as a projected flame, hand finished logs and embers that glow and pulsate. When people walk into the room, they will be stunned by the realism of the log insert. The remote control included with the fireplace insert is all digital, easy to use, and allows for full functionality of the fireplace insert. This attractive log insert uses LED lighting so that you can enjoy a more energy efficient option over gas logs and less of a mess compared to wood burning models. 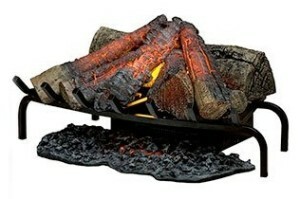 This electric fireplace will make it easy for you to relax and enjoy a flickering, warm flame even at any time. 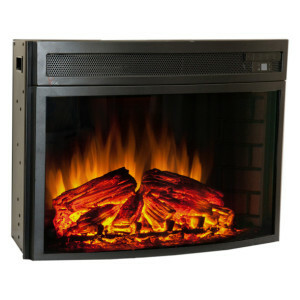 This Dimplex fireplace insert offers up to 400 square feet of supplemental heat. When customers purchase this log set, they find that it is extremely easy to set up and is realistic whether it is turned on or off. The attractive design works well in any existing wood or gas fireplace, and the realistic flames and burning embers flicker and glow just as a real fire would. Customers like the supplemental heat offered by the insert as well.